Before attempting the lab I was considering in Trying to measure ionic current through small holes, I decided to look at a simpler problem: measuring the resistance of a pair of electrodes in salt water. As I cited in the earlier post, the resistivity of 1M NaCl should be about 0.12–0.14 Ωm. Converting that bulk property into a resistance for a pair of electrodes is messy, unless a particularly simple geometry is used. There are two classical simple geometries: opposite faces of a cube and concentric cylinders. I believe that concentric cylinders are the popular shape for commercial probes, as they are fairly easy to make and there is little stray field outside the probe. I put the electrodes in a cup and added enough 1M NaCl solution to come part way up the plastic, so that the electrodes were covered just for the length below the plastic. This is a lot cruder than putting together a concentric stainless steel tube and rod with epoxy to hold them together and a relief hole, but it was cheap and did not take long to make. The electrodes in a red plastic beer cup (for that college verisimilitude). 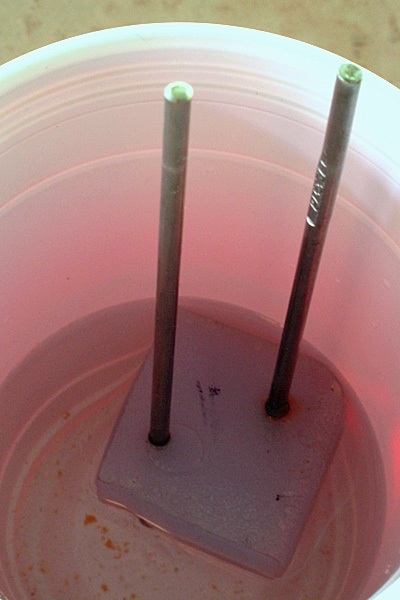 The tops of the electrodes stick out of the cup for attaching clip leads. The brown crud on the bottom has accumulated after a few days of the electrodes being in the salt water. I don’t think that 316L stainless is surgical steel (I think that is type 304). Equivalent circuit for a 316 stainless steel electrode in salt water, based on the generic model given in Figure 5.4 of Medical Instrumentation: Application and Design. The half-cell potential of -0.18v (relative to a calomel electrode) is from Galvanic Series in Flowing Sea Water. Other sources give different half-cell voltages for 316 stainless steel. Because we are using two identical stainless steel electrodes, the half cell potentials should cancel, and we are left with just a capacitor in parallel with a resistor and a series resistor. 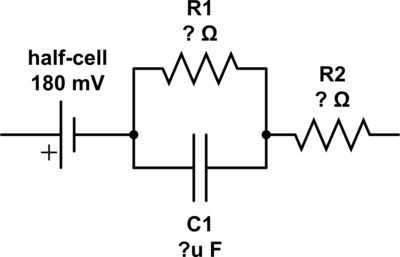 The challenge for the circuits course is to try to determine the resistances and capacitances. My first thought was to make a simple AC voltage divider, and measure the AC voltage across the unknown impedance and a known resistance (say a 1kΩ resistor). 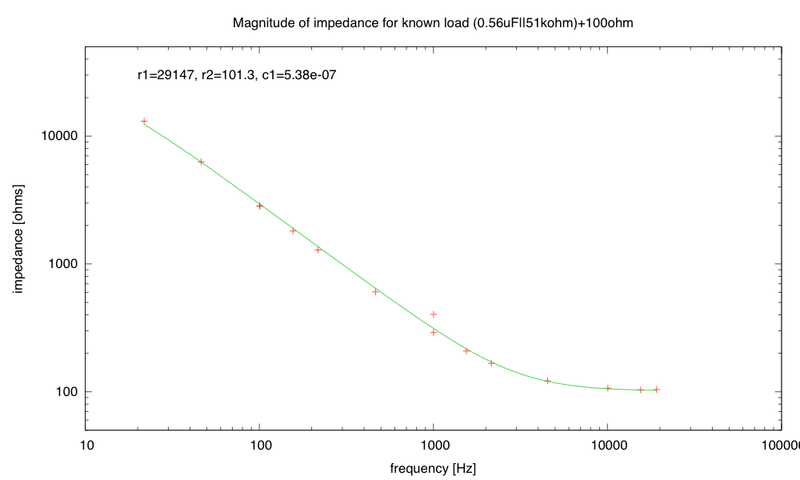 The magnitude of the load impedance would then be Vload/V100*1kΩ. 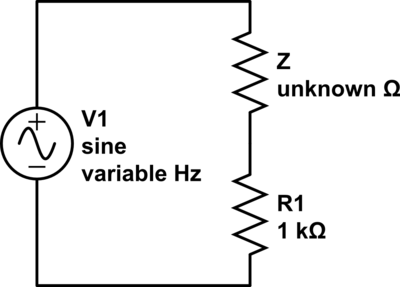 AC voltage divider for determining an unknown impedance. If the impedance is a simple resistance, the frequency does not matter, but if there is capacitance or inductance, the magnitude of the voltage will vary with frequency. 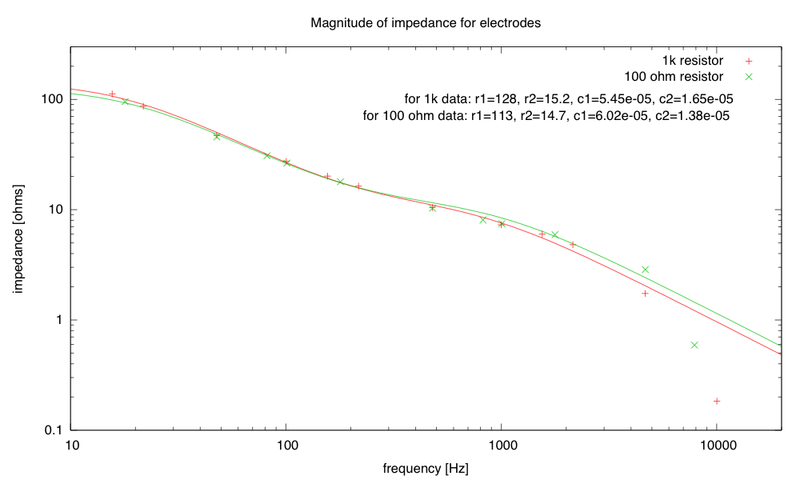 By sweeping the frequency, I could get the magnitude of the load impedance as a function of frequency. With luck, I could fit this to the theoretical curve , or since I’m not measuring phase but only amplitude , where . Actually, there is no need for all this mess, as gnuplot is perfectly capable of defining j=sqrt(-1.0) and doing absolute values of complex numbers. You can define Zc(f,c)= 1/(j*2*pi*f*c) and Zpar(z1,z2) = z1*z2/(z1+z2) and try to fit abs(R2+Zpar(R1, Zc(C1,f))), which is much easier to read and to type. 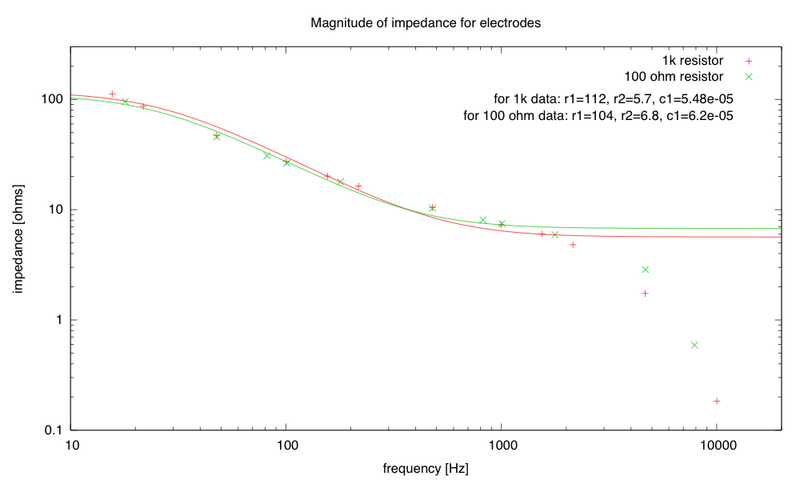 I tried making a series of measurements with a known load first (a 0.56µF capacitor in parallel with a 51kΩ resistor and a 100Ω series resistor), and then recovering the values from fitting the data with gnuplot. Because my function generator has a strong DC bias, I put a 470µF electrolytic capacitor in series with its output, to provide an AC-coupled output (otherwise my multimeter might have been confused). I used my Fluke 8060A multimeter to measure the frequency and a cheap Radio Shack multimeter to measure the voltage across the “unknown” load and across the 1kΩ resistor. The smallest voltage I measured was 22.7mV, which is plenty of resolution (the Radio Shack multimeter has trouble with voltages below about 1mV, and resolution is limited to 0.1mV). 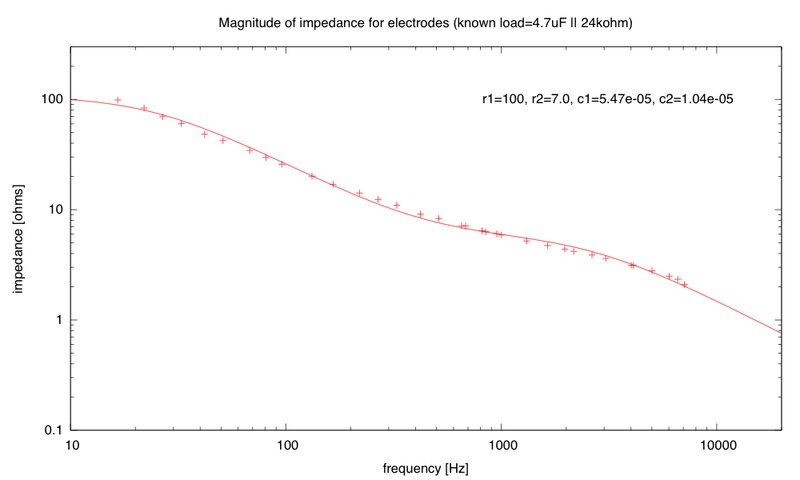 The results of fitting the parameters of the electrical model to the measured data. The fitting of R1 (the parallel resistor) is terrible—small changes in initial estimates result in large changes in the final value. One would probably need much lower frequency measurements to determine R1, but the Fluke 8060A doesn’t go down to such low frequencies. I could probably use the Arduino with an interrupt on the rising edge of the square-wave output to get the period (and hence frequency) for lower frequencies, but the Radio Shack multimeter stops giving stable AC voltage readings for too-low frequency as well, so I didn’t bother. Both R2 and C1 were recovered to within the precision of the components used, so this method looks fairly viable for those parameters. I then tried the same setup using the electrodes in 1M NaCl in place of the known load. The measured voltages across the electrodes got quite small, particularly at the higher frequencies (above about 2 kHz), and so are not very trustworthy, since we are approaching the resolution of the meter. I repeated the measurements with a 100Ω resistor instead of 1kΩ resistor, but the voltages still got quite small at higher frequencies. The curve fitting for the model is a bit dubious, as I see no evidence of flattening at the higher frequencies (which is what determines R2). Perhaps there needs to be a small capacitance in parallel with the load, to provide the high-frequency rolloff. I only fit with data below 3kHz, as the higher frequency points are dubious, because of the limitations of the Radio Shack multimeter for measuring small voltages. The two sets of measurements were fairly consistent, at least. Doing a 4-parameter fit for (C2 || (R2+ (C1 || R1)) gives a fairly decent fit to the data. There are still problems with the resolution of the measurements at the higher frequencies. I tried making the same measurements again, this time using a known impedance on the bottom of the voltage divider consisting of a 4.7µF capacitor in parallel with a 24kΩ resistor. The fit is quite similar, though different starting points for the optimization result in slightly different values for the resistors. It takes a lot of data to fit a 4-parameter model, and I’ve not found a good model with fewer parameters. It may be asking a lot of the students to fit a 4-parameter model. Students will need to know how to use a good model-fitting program. Gnuplot is nice, but installing it will be too painful for those with Macs (unless the gnuplot community has finally gotten around to making a Mac installer that doesn’t require gigabytes of downloads). Whatever curve-fitting program we use, I’d probably have to scaffold nearly the whole fitting process for them, as few students have had any experience with fitting parameters of models. It would be a good thing for them to learn, though perhaps best with a simpler model. It might also be possible for them to take the frequency response and use some sort of filter-design software to fit the model. That might be a bit tricky to set up, though, and would not give them a general-purpose method for fitting models. The students will have the advantage of using better equipment than I have at home, so their function generator will report frequency directly and their multimeter will probably be able to handle higher frequency AC input. Whether it will also handle very low frequency inputs is unclear. My original idea, to have students make salinity measurements using electrodes like these, may not be so great, as the value for R2, which would be expected to vary inversely with the salinity, is hard to recover from the measurements with any accuracy. Perhaps the capacitance (which is more easily estimated) varies with salinity also. Maybe I need to do some experiments on that also, trying 0.1M and 0.01M NaCl as well. A non-polarizing electrode would almost certainly be better, so perhaps I should get some fine silver wire, and either electroplate on some AgCl or treat it with chlorine bleach to form AgCl chemically. It might be worthwhile to have two sets of electrodes, both stainless steel and Ag/AgCl, for the students to measure, so they can see the difference between polarizing and nonpolarizing electrodes. If we do use Ag/AgCl electrodes, it might be a good idea to get some sintered ones, rather than coating silver wires. The E215P from Invivometric looks suitable, but costs $19.40 per electrode. I’m not sure that they are enough better than having the students coat silver wires to justify the price (and learning to make Ag/AgCl electrodes could be a useful skill for projects in other labs). Hello, i noticed that you wrote this several years ago, but i find your work very interesting. I’m trying to develop a similar solution with a home made 4 electrode probe and my question is , does that equivalent circuit for a 316 stainless steel is still true with a 4 probe, because now there no current flowing through probes where i’m measuring the probe and the ac current source is constant. I don’t think I understand your question. The standard 4-probe resistivity measurement assumes three resistors in series, putting a known current through the three and measuring the voltage across the middle one. The other two resistances are not measured, under the assumption that there are local effects near the contacts that are not of interest. By using a very high impedance voltmeter, you can mostly ignore the impedance of the voltmeter electrodes, because the currents through them are so small. Of course, if your contact impedance is close to the impedance of the voltmeter, then it still matters. Looking at the 4-point method in more detail, I see I’ve gotten it somewhat wrong, as it assumes a uniform sheet of material with 4 point contacts in a line, and the theory relies on how the electric field behaves in a (usually thick) sheet of material. If I were still a mathematician, I’d probably be able to remember how to do conformal mapping to handle the 2D case, but even then the 3D case for thin films would probably have required numerical approximation. The current between the two middle points is not identical to the current between the end points, but is a constant factor times the current, dependent on the geometry. The basic idea, of measuring the voltage from electrodes that don’t have current through them, is still the same. Although I’ve cast the problem here as a measurement of salinity, what I’m really more interested in teaching students is the impedance of electrodes—so that they understand why so many of the biosensors use Ag/AgCl electrodes and not stainless steel. Maybe I should a section in the book about 4-probe measurement, though. Hello, sorry for so late reply. Thank you for your answer, it already shades some light, but let me try again. When i started to think about this, i saw the model you have above, a capacitor in parallel with a resistor and in series with the water resistance and since we are using an AC source, and considering at, not very high or very low frequencies, i would be measuring an impedance and not just the water resistance. That’s why i faced to the 4 pole solution and my question is: with 4 pole solution when i’m measuring the relation voltage/current it will give the real resistor, not the impedance, correct? So i wouldn’t need to worry about measuring the phase shift or measuring at very high frequencies to create a shortcut in the capacitor. Am I right ? I understand you are approaching through for other purposes, but I looked to your articles with great interest and it seems you have valuable knowledge about this subject. With the 4-probe measurement, most of the surface effects that result from the ionic current will be happening at the input electrodes, rather than at the measurement electrodes. But there will still be some capacitance at the measuring electrodes, so the voltage at the measuring electrodes will be somewhat frequency-dependent. The idea is that by controlling the input current, but using a very high-impedance voltmeter on the measurement electrodes, the impedance of the measuring electrodes does not matter much. Consider an extreme example, where the solution to measure is in a glass tube, the input electrodes are in the solution at the ends of the tubes, and the measuring electrodes are on the outside of the glass tube. The glass acts as the insulator of a capacitor, and if you tried to do a measurement at DC, you’d get no signal. At low frequencies, the impedance of the capacitor may be large compared to your voltmeter, making the measurements much smaller than they should be, but once the frequency is high enough that the capacitance provides less than say 1% of the voltmeter impedance, you can make pretty accurate measurements of the voltage inside the tube.